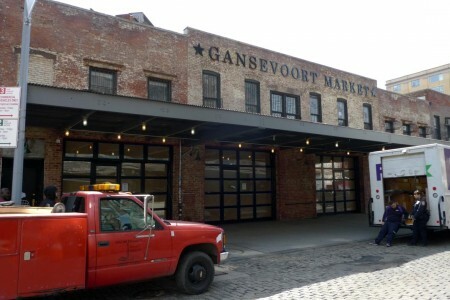 We recently wrote about Aurora Capital’s and Gottlieb Real Estate’s efforts to evict thriving businesses from the block of Gansevoort Street that would be the site of their massive development plan (see Aurora and Gottlieb Creating “Intentional Blight” on Gansevoort Street?). The result is to make the street look increasingly derelict in what may be an effort to undercut support for its preservation. 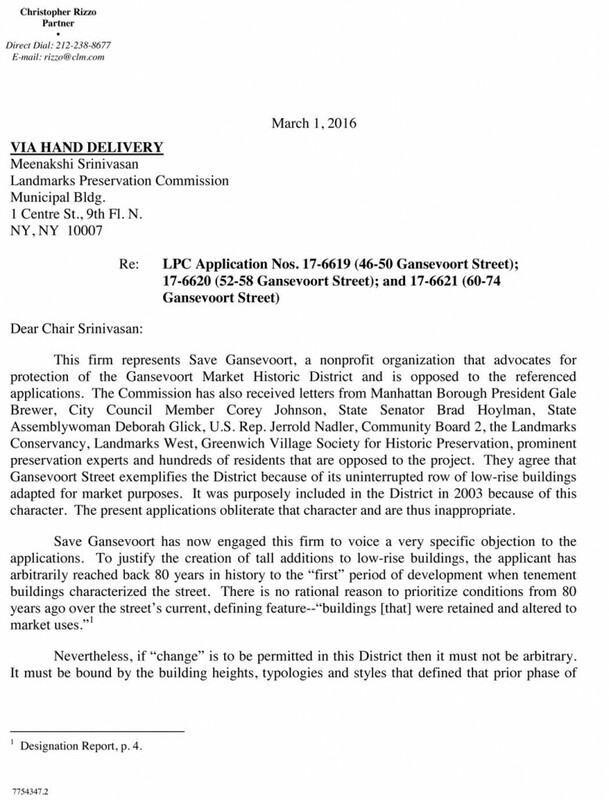 At the Landmark Preservation Commission’s February 9th public meeting on 46-74 Gansevoort Street, the commissioners took the developers’ argument to its logical conclusion (see our earlier report). 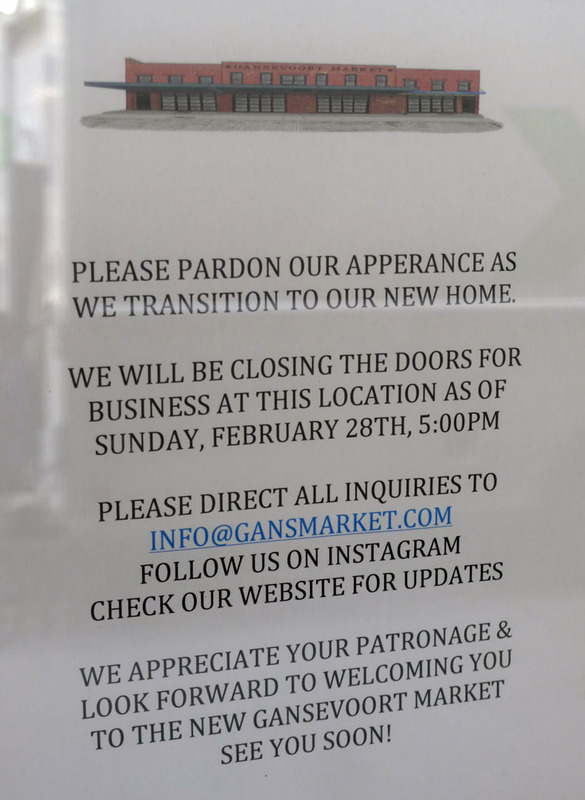 They said that if the developers replaced the low-scale market buildings at 60-68 Gansevoort with a new structure intended to replicate the previous tenement buildings on that site, then the new structure should not be taller than the tenement buildings it is supposedly intended to replace. 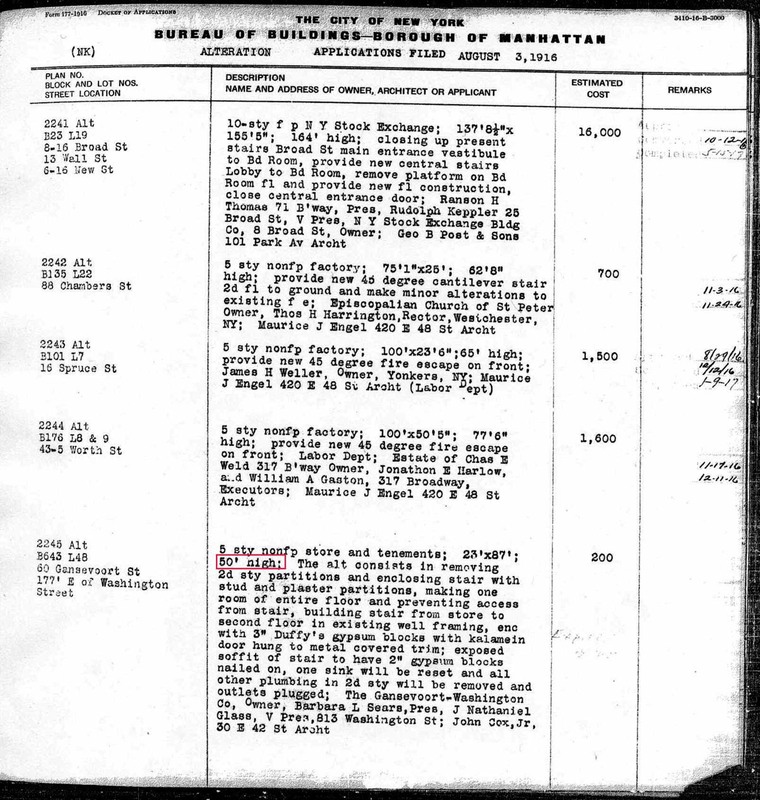 With the assistance of the Greenwich Village Society for Historic Preservation, we have now researched Department of Buildings records for these tenements (photos show that all were approximately the same height). 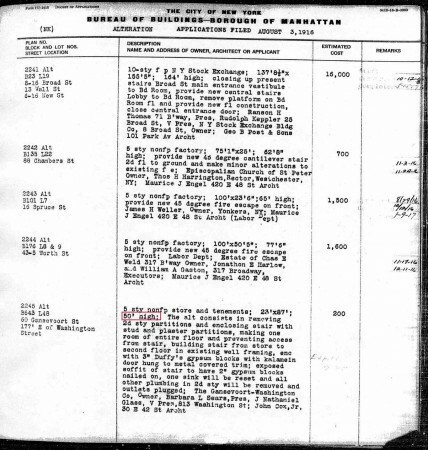 Alteration Permit 2245-1916, Alteration Permit 2246-1916, and Alteration Permit 680-1922 – for 60, 64, and 70 Gansevoort Street respectively – all list the heights of the tenement buildings as 50 feet. Moreover, the heights listed on these permits generally include cornices. 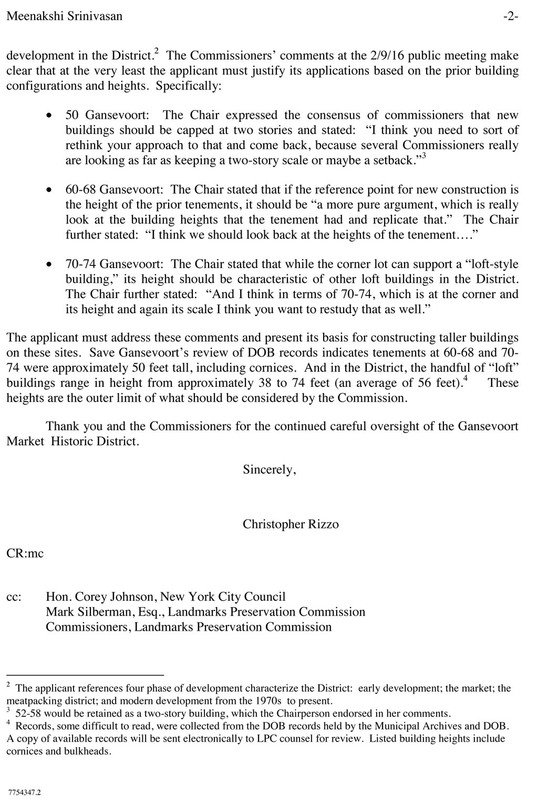 Therefore, any new structure that the LPC approves at 60-68 Gansevoort Street should not be higher than 50 feet tall, INCLUDING THE CORNICE. The developers’ own logic would argue that the new building at 70-74 Gansevoort should also be no higher than the tenement buildings previously on this site. However, the commissioners indicated that the new building at 70-74 Gansevoort should be considered a “loft-style” building, and that its height should be characteristic of other loft style buildings in the Gansevoort Market Historic District. There are seven such buildings; their heights range from 38 feet to 74 feet, including cornices. The average height of the seven buildings is about 55 feet, including cornices. 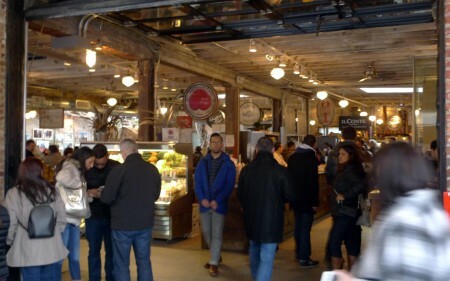 We believe this is the upper limit of what should be allowed at 70-74 Gansevoort Street. These heights are significantly lower than those of the buildings that the developers originally wanted to build. The Greenwich Village Society for Historic Preservation has also sent an excellent letter to the Landmarks Preservation Commission making similar points. Will the LPC stand firm and insist that the developers respect these height limits? Stay tuned. The developers will have to present his revised plans at a future LPC public meeting. 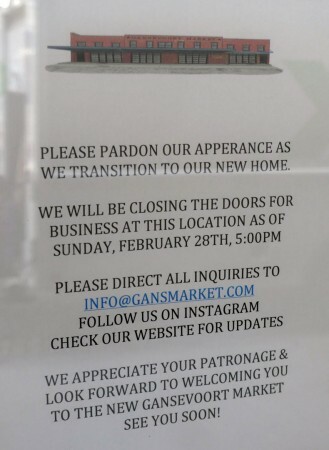 We’ll get the word out as soon as that meeting is scheduled.